Chances are you've heard Ellis Hall, even if you've never heard of him. These days Ellis Hall specializes in movie cameos and character voices. That was Ellis playing organ and belting gospel tunes in Martin Lawrence's Big Momma's House. He was the voice of the head rooster in the claymation smash Chicken Run. He scats his way through a Louis Armstrong tune in the new Steven Spielberg/Tom Hanks film Catch Me If You Can. And when rubber-faced comedian Jim Carrey breaks into manic song in his soon-to-be-released new comedy, you'll be hearing the voice of Ellis Hall. I've always been able to hear lots of voices in my head. I guess that's why they call me schizophrenic! Hall didn't always specialize in character voices. Born in Savannah, Georgia, and raised in Boston, he came to California in 1984 and promptly assumed the lead vocalist position with perennial funk faves Tower of Power. But at some point people started noticing that Ellis possessed more than just a mean set of R&B pipes. "People would call me and notice I had a good character voice while talking," he recounts. "Then they'd ask if I could do other flavors. I have always been able to hear lots of voices in my head." He pauses, then laughs. "I guess that's why they call me schizophrenic!" Hall says he enjoys creating characters with his vocal cords: "It's a kind of acting, and I enjoy the challenge of it. For some characters I have to completely change my voice. For example, I play the Baron of Bug Way for a new attraction at Disneyland's California Adventure. He's a spider and a one-man band who sings 'The Ugly Bug Ball' with a cool, raspy-voiced vibe. For Sesame Street Live, I became Uncle Grizzly, an old bear. And I played the old, toothless raisin for the California Raisins campaign." 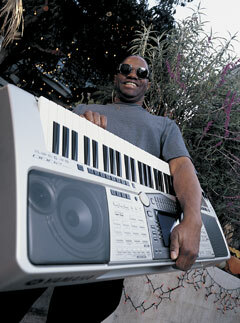 To hear Hall tell it, his main ax, a Yamaha PSR2000 portable keyboard, boasts almost as many characters as he does. "It's the most amazing instrument," he states. "The first time I played it, they couldn't drag me away. My poor wife was paging me, saying, 'Where are you, Ellis?'" What's so special about it? "Well," says Hall, "I play bass, drums, guitars, and keyboards, but it's great to be able to just push a button and get all those sounds from one instrument. All the guys say, 'Hey - you're replacing the whole band!' The PSR2000 has the meat-and-potatoes flavors I need: nice pianos, great Rhodes sounds, fantastic solo synths. It also puts a whole lot of new colors in my hands, colors I hope I can create something uplifting with. Forgive me for sounding like a commercial, but when an instrument touches me inside and out like this one does, I've got to talk about it!" Yamaha portable keyboards have long been the songwriter's secret weapons, but Hall insists they also excel as gigging instruments. "Some people see the built-in speakers and say, 'Are you sure that isn't a toy?' But as soon as my musician friends hear it, they ask, 'What is that keyboard?' I can also plug a mic into it and have my own little PA system. Obviously, you wouldn't use that on a serious professional gig, but for smaller, spur-of-the-moment things, it's great to just show up with the PSR, plug in, and boom! I tell you, I've done many, many gigs like that." For another upcoming project, Ellis Hall reprises one of his best roles: Ellis Hall. 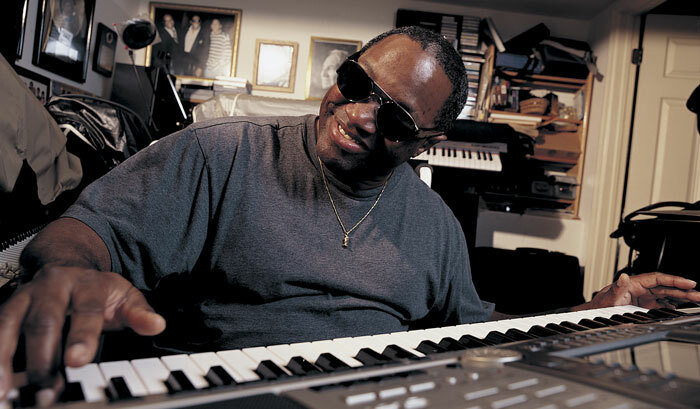 He's just signed a solo deal with Ray Charles' Crossover Records and is currently recording a new album, co-producing with the R&B titan himself. He'll be accompanied by a stellar lineup of session players, including drummers Harvey Mason, Ricky Lawson, and Sheila E, and bassists Nathan East and Lee Sklar. "I've played with a lot of these people over the years," says Hall, "and now it's great to have a chance to step out with them a little bit. George Benson even wants to write the liner notes." Hall describes the as-yet-untitled album's music as "good old solid soul." "It's a real crossover record," he says. "It's an ageless kind of vibe with ballads and even some country. I tell you, we'll have some wonderful, wonderful colors there." Sounds like Hall isn't so much "schizophrenic" as uncommonly versatile. "Well," he allows, "one of my personal catchphrases is 'Pigeonholes are for the turkeys who try to put you in 'em.' I just try to sing and play to the best of my abilities and not fake it. The Lord has given me many blessings, and I plan to spread them around."